Culture Minister Miri Regev notes Basel Ghattas's ascending the Temple Mount constitutes incitement - but will Edelstein listen? Culture Minister Miri Regev (Likud) called on Knesset Speaker Yuli Edelstein to remove MK Basel Ghattas (Joint List) from the Knesset on Wednesday, after he ascended the Temple Mount despite a blanket ban for all MKs. 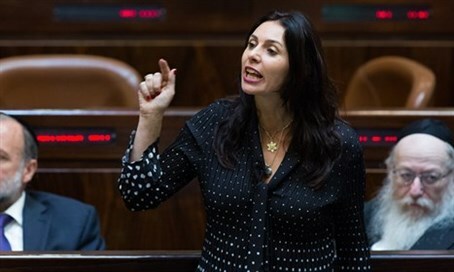 "I call now to Knesset Speaker Yuli Edelstein for the removal of Basel Ghattas from Israeli Knesset," Regev said. "Ascending the Mount against the Prime Minister's orders is a provocation that could cost human lives." "We cannot let him and his friends take advantage of democracy to harm Israeli citizens." Regev refers to the Palestinian incitement surrounding the Mount, which is Judaism's holiest site. Muslim preachers and officials from the Palestinian Authority (PA), Gaza, Jordan, and elsewhere have repeatedly claimed that the site is a Muslim holy site, and such incitement has driven an unprecedented wave of Arab terror against Israelis for "defiling" the site. Edelstein will likely reject Regev's call, however, as he specifically asked MKs earlier Wednesday not to respond to Ghattas ascending the Mount. "I appeal to members of the coalition - let's not react with our own protests," he pleaded. "We, at least, will act like human beings." "Enough, enough, enough!" he added. "You do not have to wait until we get to the point of bloodshed. You can be an MK without being a pyromaniac." He added that he did not take action to revoke Ghattas's immunity due to updates and explanations he received from security officials on the matter. Edelstein's comments are likely a response to MK Itzik Shmueli (Zionist Union), who branded Ghattas "a genuine pyromaniac who feeds off of the violence and incitement and is interested in continuing to spread it. "The state's policy is clear: the status-quo will be preserved. But for Ghattas the urge to encourage violence is more important." "Most Israeli Arabs do not hold his separatists and extreme positions," Shmueli added. "So I expect the other Joint List members to decry this unnecessary action." Even the leader of the Opposition, Yitzhak Herzog (Zionist Union), issued criticism of Ghattas - although he followed it with criticism of pro-Temple Mount ministers Tzipi Hotovely (Likud) and Uri Ariel (Jewish Home). "MK Ghattas's ascension to the Temple Mount is the most severe [offense]," Herzog stated Wednesday. "This is an attempt to fan the flames of terror in Israel." "Once again, he adds fuel to the fire unnecessarily during this sensitive time," he added.